Aliette de Bodard's The House of Binding Thorns is the sequel to last year's The House of Shattered Wings, a book I described as “more The Godfather than... sword-and-sorcery adventure”. In this installment, a handful of characters from the first book are still struggling to survive the mafioso-style wars between the various Houses of Paris, each of which is ruled by a fallen angel. Several new characters are introduced, and the scope of the battle is expanded to the bottom of the Seine, where a dragon kingdom has now entered the fray. 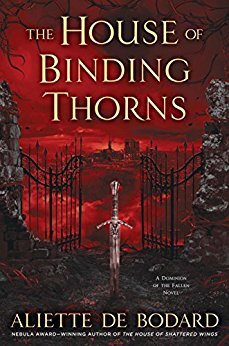 The House of Binding Thorns is so lavishly imagined that it (mostly) overcomes my earlier criticisms about the series being all flash and no substance. Sure, some part of me is still whining that I don't understand how magic in these books works, or the devastating historical event that predates the story, or what the world is like outside of the author's hellscape version of Paris, but I was sufficiently distracted by the book's beauty and horror and action to overlook it. Atmosphere and style aren't everything, but they're a lot, and The House of Binding Thorns has them in spades.